if you’re still casting about for an additional side to add to your thanksgiving repertoire or you just want to try a new and exciting dressing/stuffing this year, boy do i have a treat for you. if you have had thanksgiving with me in the last several years, you’ve had this dressing. a few times i’ve even used my own homemade tamales. i also make a very traditional bread and sage dressing so everyone can have what they want, but this one always runs out first. there are a few variations of this dressing floating around out there and mine is originally from the local paper, but i can’t remember the source anymore. i have really adapted it to be my very own, however. the original and my own have diverged completely with the exception of the spirit of the dish. it’s thanksgiving’s crazy-mixed-up tex-mex cousin, who came up from the valley for the holiday. looking forward to all the family that is coming to our house for thanksgiving ~ hope yours is wonderful! preheat oven to 350 degrees. 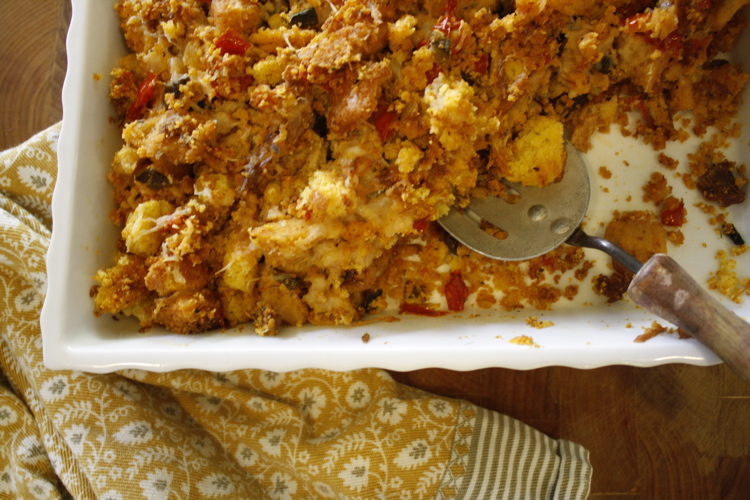 crumble tamales and corn bread into large bite-size pieces by hand into a large bowl. do not blend or process as this will result in a very dense and mushy dressing. saute tomato (drain if using canned), onion, pepper in a a few tablespoons of butter until soft (about 5 minutes). add oregano through through cumin and saute for about a minute. add salt and pepper to taste. cool briefly. add tomato mixture and cheese to tamale/cornbread mixture and toss gently-do not over mix. pour into a large greased casserole or baking pan and bake for 30 minutes until heated throughout and lightly browned on top. so, as if you didn’t already have enough ways to overindulge this holiday season, let me add another to the pot. i first made this ice cream last year about this time. i liked it so well that i made it 3 more times. in a row. like as soon as i ran out, i had to have more. it’s a nice treat during the holidays because it can (and must) be made ahead of time. it’s kinda nice to know that if all else fails in the meal, at least there’s this beautiful, silky, pumpkiny concoction waiting dutifully in the freezer. i need to keep it short this time so i can get back to planning my thanksgiving meal, but i will say that if you’re feeling frisky, you can substitute some of the cream with pumpkin ale. it’s real good. in a small bowl, whisk together pumpkin puree and vanilla. set aside in fridge for a few hours so that flavors have a chance to influence each other. in a heavy saucepan over medium-low heat, gently heat 1 1/2 cups heavy cream and 1/2 cup brown sugar. cook into bubbles form around edges of mixture, about 5 minutes. watch closely-do not let boil! meanwhile, in a bowl combine together egg yolks, cinnamon, ginger, , nutmeg, salt, and the remaining 1/2 cup heavy cream (or pumpkin ale!) and 1/4 cup brown sugar. whisk until well combined. remove cream mixture from heat. gently mix about 1/2 cup of the hot cream mixture into the egg mixture. (and guess what, fancy pants? you are tempering your eggs! who knew?) pour egg mixture into pan of cream and simmer over low heat, stirring constantly with a wooden spoon until it coats the back of the spoon, about 4-6 minutes. carefully (it’s hot!) draw a line through mixture on back of spoon-it should leave a clear trail. again, do not boil! pour through a fine mesh strainer or sieve to remove any lumps. place the bowl into a larger bowl of ice water to cool mixture quickly, stirring occasionally to cool more quickly and prevent a ‘skin’ from forming. once cooled, add pumpkin mixture and stir until well-combined. cover with plastic wrap, pressing directly onto surface of mixture. refrigerate for at least 4 hours, but honestly, you will have the best results if you can chill it 12-24 hours. transfer your custard to your ice cream maker and churn according to manufacturer’s instructions. add bourbon or pumpkin ale, if using, during last few minutes of churning. place in freezer-safe container and freeze for at least 3-4 hours and up to a week. 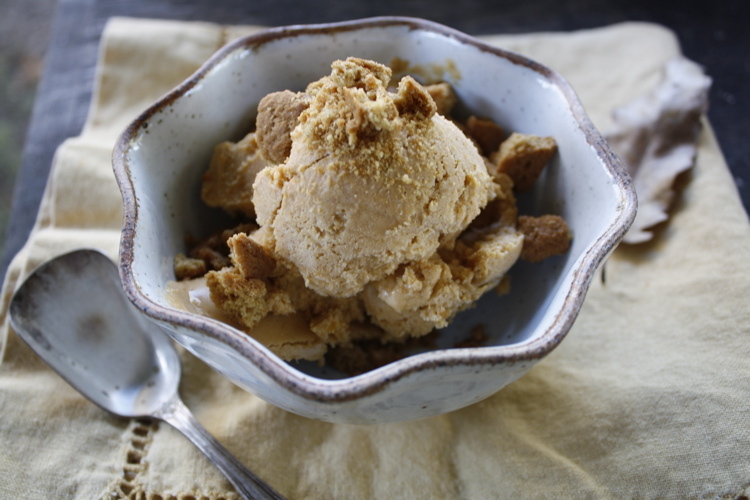 serve with crumbled gingersnaps on top! * to make fresh pumpkin puree, cut 1 large or 2 small sugar pumpkins (do not use regular field or carving pumpkins) into large chunks or quarters; remove stems. roast in shallow pan, cut sides down, with a little water on the bottom in 400 degree oven until tender, about 1 hour. when cooled, remove skins, seeds and stringy material. push through a sieve or food mill. freeze any leftover puree in a plastic bag with air removed. recipe states can freeze up to 2 months, but honestly, if you freeze correctly, it will keep for up to a year! it may surprise you, considering how many sweet treats i make and write about on this blog, that i consider myself more of a savory than sweet-type person. you heard me right, i really do not have a sweet tooth. gasp, i know. it’s crazy, too because i love to bake cakes, tarts, cookies, et al, but i tend to eat desserts only on special occasions or in lieu of a meal. (insert late afternoon slice of pie and cup o’ joe here). for this month’s let’s lunch challenge, the group has decided on a ‘fall desserts’ theme, which seems to fit in with the whole dessert-as-meal-replacement plan. this time of year does bring out a bit of the ol’ sugary cravings, i suppose. i tend to go for more earthy, fruit-based concoctions over super-sweet chocolate or frosted ones. but i’m weird that way. should i even mention that i would take a lemony anything over a chocolate something else? this would be a good dessert after a nice fall meal or even, dare i say, as an appetizer with a glass of bubbly or red wine. you could even leave out the blue cheese and serve warm with homemade whipped cream or a scoop of vanilla ice cream. for the pastry, place flour, salt, and sugar in the bowl of a food processor fitted with the metal blade. pulse 2-3 times until well-combined. add the butter and pulse 10-12 times until butter is in small, pea-sized pieces. be sure to use the pulse feature, you do not want to over mix and create a paste. with the motor running, pour the ice water through the shoot until the dough just comes together (you may not use all the water depending on the humidity level and other factors). dump dough onto a floured board and quickly knead into a ball. at this point, i like to press the dough into a disc the shape of how it will be rolled out, i.e. a round, square, or in this case, a rectangle. wrap in in plastic and chill for at least 1-2 hours. roll dough into a rectangle about 10 x 14 inches. trim the edges straight with a pizza cutter or knife. for a more rustic look, you can omit this step – i do not judge. place dough on prepared sheet pan and chill while you are readying the apples. peel apples and cut through the stem, removing stems and cores with a sharp paring knife or melon baller. slice the apples crosswise into 1/4 inch slices, leaving slices together in order. place slices in diagonal rows on pastry, starting in middle of the tart, then adding adding rows of apples to fill in until pastry is covered. sprinkle with the full 1/2 cup of sugar and dot with the butter. although it appears like a LOT, do not be tempted to cut down the amount of sugar~the tart will be, well, very tart if you do. bake for 45 minutes to 1 hour, until the pastry is browned and the apples have brown edges. rotate the pan once during cooking. you may deflate any air bubbles that form by poking them with a small knife. don’t worry if the juices run off and start to burn, this is expected. remove tart from oven. heat jelly and calvados in a small pan and brush mixture on pastry and apples. dot with the blue cheese – use as much as you prefer, but be warned, a little goes a long way. it will gently and beautifully melt into the gallette. loosen tart from paper before cooling so it doesn’t stick. allow to cool and serve warm or at room temperature. pumpkin cinnamon rolls (yeah, you heard me). oh, kitchen aid mixer with dough hook attachment, i will name my first born after you. promise. just look at this gorgeous dough. it just screams FALL!! i think this shadow looks like an elephant. anyhoo, brush butter on your rolled out dough rectangle. roll ‘er up and place cut rolls in pan. at this point you could stash them in the fridge, do your 2nd rise in the am, then bake. otherwise, you’d be getting up at 4 am to make this for a crowd. the first time i made these, we ate them at 2 in the afternoon, if that’s any indication. not that there’s anything wrong with that. *adjust amount of water added depending on humidity and baking conditions-a.k.a. add less to begin with, then slowly add more to make a smooth, non-sticky dough. *honestly, i had to double the amount of glaze, either it was because i made 12 smaller rolls (instead of the 9 the recipe states it make) or i am just crazy for glaze. mix and knead all dough ingredients together in a standup mixer fitted with a dough hook. . alternatively, you could do this by hand, but why would you? unless you were amish. my apologies to my amish readership. remember to add the water slowly after you add all the other ingredients, until you get a smooth dough. you can always add more water, but you can’t take it out once it’s been added. place the dough in a lightly greased bowl, cover, and allow to rise about 1/2 hours, until it doubles size. turn the dough out onto a lightly greased surface and roll into a rectangle about 14″x 22″. it will appear on the this side. brush with a few tablespoons of melted butter. mix together the filling sugar and cinnamon and spread out over the dough, leaving one short edge with no filling (this will be the end of the roll). top with raisins or nuts, if using. starting with the short end of rectangle that is covered with filling, begin rolling dough into a log. cut log into 9 (or 12 smaller) rolls. place the rolls in a lightly greased pan that is at least 2 inches deep, to accommodate more rising. set aside, covered, to rise for 1 more hour. preheat oven to 375 degrees. bake for 25-30 minutes, until lightly browned and rolls appear set in center. cool on a rack for about 15 minutes. while cooling, make glaze. heat butter and milk until butter melts, whisk in sugar until dissolved into mixture and drizzle over pumpkin rolls while they are still warm. if you like a frosting rather than a glaze, apply glaze after rolls are completely cool. is this enough glaze yet? just barely.